It’s been a cold ride here in New Hampshire for a few weeks. However, like a campfire, on average we may end up less than average on HDD’s for the month. I say like a campfire, because it always seems that one side is too hot and one too cold to really enjoy it, however on average….It’s raining hard here today, so once again the snow is leaving. This will ruin the skiing and winter sports and yet it’s really too cold to enjoy summer sports. Winter in Northern New England has become a lot like southern New England. But that’s a different topic. 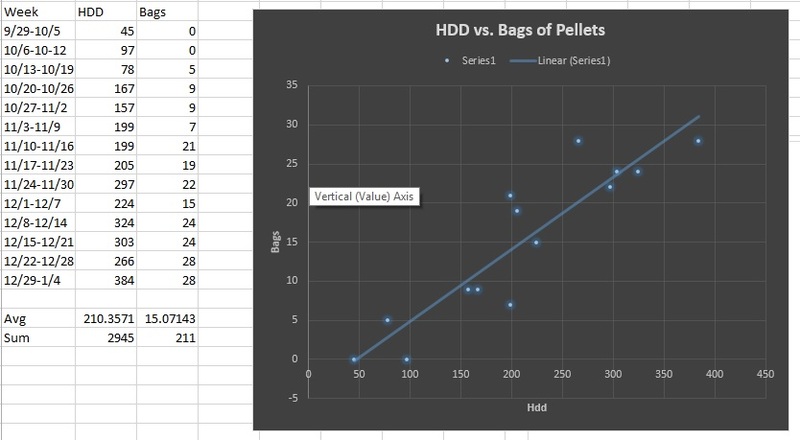 The pellets seem to be a pretty steady 14HDD per bag. And so a ton this time of year lasts about two weeks, maybe a little longer. We bought our first ton this year, I was using up old stock and we bought a ton from Tractor Supply, their brand. I am liking them a lot, they seem to not cause any ash build up problems at all. I will buy them again. If you add up all the bags used and divide by 50 bags/ton we are at 4.22 tons heating season to date, for a total cost of $947.39 at the cost of $224.50/ton.